Don't adjust your monitor, you're not seeing things! I do on occasion use bright colors in my creations. Of course I had to add in my signature Black layers to pop my panels! Isn't this just the cutest image to send to your girlfriends? 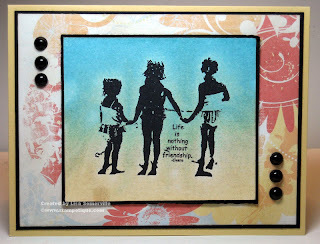 I stamped the 3 Girls image from Stampotique Originals in Black Archival on White card stock. To add color I used the Glimmer Mist Watercolor Technique in Crushed Coral and Caribbean Blue. Wonderful card. The glimmer mist really lets the image pop. And the background is so perfect for the whole look. 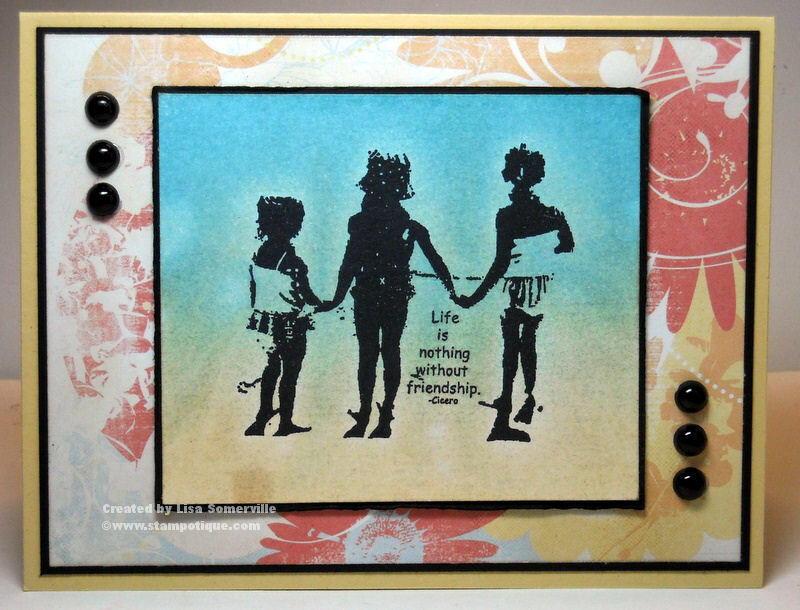 Stunning card, luv the colors GF! your colors on this with the black are absolutely stunning!!! Gorgeous! what a fun card Lisa - I love it!